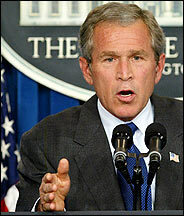 A great deal of print has been wasted on President Bush’s inability to tell the truth. In fact, it really makes little difference whether Bush is a pathological liar or not. What is meaningful however is that deception is the primary tool for the maintenance of the state. Transparency and candor are now seen as direct threats to the preservation of the status quo. This suggests that Bush’s lying is not simply a matter of human frailty or corruption, but a clear statement of administration policy. This may seem like a minor point, but in fact the conduct of the Bush administration cannot be seriously evaluated without understanding that deceit is the cornerstone of their class-based world view. Evidence of this is everywhere, right down to the language that is painstakingly minted in right-wing think tanks to conceal the real meaning of administration policy. “The war on terror”, preemption”, and “enemy combatant” are just three expressions that are intentionally designed to mislead the public. The real purpose of this language is to elicit support for unpopular policies that serve the exclusive interests of elites. Administration policy is normally reduced to snappy sound-bytes that charm the public and keep the main players “on message”. They are released as “talking points” to their political and media surrogates and disseminated from every newsroom and radio-station across the country. This is the true meaning of propaganda; “to propagate” one’s ideas from many vantage points. No one has succeeded at this better than the Bush administration. As many commentators have already noted, the lead up to the war in Iraq was perhaps the “high-water mark” for state propaganda. Dissenting, anti-war voices were excluded from all the major media and the false, uncorroborated charges against Saddam were highlighted in a way to make war inevitable. Reflecting on the imagery and theatrics that went into marketing unprovoked aggression, the media-coup was carried out with astonishing precision. Since then, however, media credibility has steadily declined; leaving the public increasingly disenchanted with the ongoing occupation and distrustful of the coverage. The “privately” owned media is only capable of producing a narrative that is compatible with the goals of ownership. Curtailing civil liberties (Patriot Act, National ID etc) and waging war are never in the public interest; they only serve the narrow objectives of the few who stand to gain from them directly. It is critical that the propaganda-system be progressively exposed so the public can see its destructiveness and work to create a different model. At present, the American system of governance is so inherently corrupted that there is very little worth salvaging. The electoral system has been clumsily rigged with voting technology that maintains the appearance of democracy, but eliminates the real possibility of majority rule. Similarly, the US Military, now deeply imbedded into domestic affairs is directly involved in “Strategic Intelligence” operations that are almost exclusively designed to deceive the American people to sustain support for foreign interventions. Pat Tillman and Jessica Lynch are classic examples of intentionally misleading Military information, but there are countless others related to the use of banned weapons, bombed wedding parties and fabricated civilian casualty-rates. Similar to the Bush administration, Pentagon deception is a matter of policy not simply a “cover-up”. Nothing they say should be taken at face value. In Iraq, we have seen the military insert friendly journalists into their operational structure; ensuring that the message they produce corresponds with their overall strategic goals. The “embedded” journalist-phenomenon establishes news organizations as a front-line part of the military apparatus. The media is now a fully integrated part of the armed services. The American people have seemingly accepted this transparent absurdity without question. On the other hand, we’ve seen journalists, who prefer to stay beyond the reach of the military’s control, directly targeted and sometimes killed. This gives us a good idea of how serious the civilian leadership takes its role of making sure that the “facts fit the policy”. In all areas of American life, information is being manipulated to manage public perceptions. Most TV programming is intentionally designed to make sure that the public is removed from the economic and political facts that may either inform them of what is really going on, or inspire them to get directly involved in the process. The goal of media is to create a reliable base of consumers, not to cultivate informed citizens in a participatory democracy. Julius Caesar recommended “Bread and circuses” to keep the people amused and uninvolved. The American media has faithfully honored that counsel. With Bush the information-war has entered a new and more aggressive phase. BBC has been purged by hostile groups after David Kelley stated that Blair had “sexed up” the information that supported the drive to war. Similarly, PBS and NPR have been infiltrated by Bush-loyalists to remove liberal elements and craft a message that pleases their corporate constituents. Also, Al Jazeera, which provides a uniquely Arab view of the world to 40 million people, has been put up for sale due to the extraordinary pressure applied by the Bush Administration. Bush’s top lieutenants are entirely committed to creating their own storyline and calling it news. They are not restrained by the facts that emerge from the”reality-based” community. They are equally zealous about seeking out conflicting points-of-view and silencing them through their attack-dogs in right-wing radio. We should assume that they will do whatever it takes to eliminate the voices that compete with the one message they want to convey. This means that the internet, which is perhaps the last outpost of democracy in America today, is undoubtedly part of the broader government strategy for controlling information. The internet is seen as “command and control” for the disparate leftist and liberal groups that foment resistance against the political establishment. There should be back-up plans to protect this vital resource. The Bush administration has already demonstrated its penchant for toppling regimes through “decapitation” or removal of the leadership. As the nexus for leftist organization, the internet is a logical target for this type of government disruption. Any attack on the system would be catastrophic for the antiwar and anti-imperial movements as well as a serious body-blow to personal freedom. Be forewarned. Both free speech and its antecedent the truth are much greater threats to the state than any bomb-wielding revolutionary. In the new world order only the managers are entitled to the truth, not the managed. That way, the public can be moved sheep-like in the direction of government policy. This means that hard news on any topic is the implicit enemy of the political establishment. It is only by providing a constant stream of diversions and fear engendering alarms that the public can be kept in a persistent fog and deprived of the right to choose. Information is freedom; and that freedom is destined to become the province of the ruling class alone if the public fails to organize resistance. The administration is “privatizing” information in the same way they have privatized all of the other tangible forms of wealth. The rest of us are left with the lies and distortions that course through the government’s ideological-filter. This isn’t a battle that can be won without a struggle. We believe that the truth is the birthright of every human being who will pursue it with an open heart and an inquiring mind. And, we will fight to preserve that right.